In my constant pursuing of Netflix in search of new and interesting, hopefully bearable things to watch (as many of you know I am a chronic insomniac), I have recently stumbled across the BBC miniseries Wallander. The series is adapted from Swedish novelist Henning Mankell's Kurt Wallander novels and stars the Kenneth Branagh. This would be the actor who in my humble opinion is the quintessential Shakespearean actor and one who can bring the Bard's tales to life in a way no actor can. Watch Henry the V and you will be a fan for life. 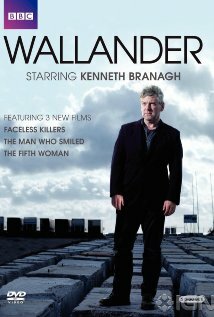 Wallander is a great series. Filmed much like BBC's Sherlock (one of the best series I seen in a long time and a personal favorite) as hour and a half long mini movies, the series follows the very human and fallible Wallander, a police inspector who, like one would expect, investigates crime in a small Swedish town. What makes the show interesting however, is not the great acting, unusual location for a murder mystery series, or the well developed characters; it is the fact that despite all of these positive elements, I keep falling asleep while watching it. Normally, this would be an event foretelling a negative review. But that is not the case. The show is well done and quite compelling. All the more reason I can not for the life of me figure out why I keep falling asleep. I mean, I've managed to stay unwillingly awake through some pretty spectacularly awful Netflix choices. It took me two separate viewings to make it all the way through the first episode. The third I haven't finished yet despite three separate attempts. I can't help but be reminded of an old man falling asleep during his favorite episode of Matlock or Murder She Wrote. Following the obvious logic string, I can only deduce that I must be getting old. Prematurely old I might add as I thought my falling asleep during Murder She Wrote days were at least another thirty years away. Ironically, I've seen Murder She Wrote on several occasions and not once fallen asleep. In conclusion, I have, for the time being, discovered a cure for my insomnia. Unfortunately, I really want to know what happens at the end of episode three, titled One Step Behind. It may be that I'm gong to have to head to my local library and pick up Mr. Mankell's books.